In her first book, The Grassfed Gourmet Cookbook, author and livestock farmer Shannon Hayes introduced a radically simple concept: sustainable practices like pasture-based farming translate into food that is tastier, healthier, and better for both people and the planet. The key to getting the most out of pasture-raised meats, though, is understanding how to cook them properly. 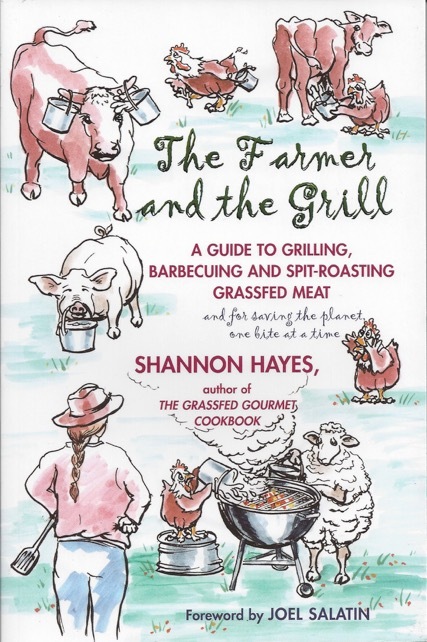 In The Farmer and the Grill, Hayes offers useful tips on grilling, barbecuing, and spit-roasting all cuts of pasture-raised meats: beef, lamb, pork, and poultry. Dozens of simple, straightforward recipes provide all the basic cooking instructions, plus directions on how to make a variety of herb rubs, marinades, and barbecue sauces to accompany the meats. Traditional techniques such as Southern barbecue and Argentine-style asado cooking will help readers grill like the pros. And specific notes from pastured-based farmers on dealing with natural variations in grassfed meats will ensure success every time out. Creative and mouth-watering recipes include Tamari-Orange Whiskey Kebabs, Grilled Steaks in a Cilanto-Olive Paste, and Rack of Lamb with a Spiced Fig Crust. Plus, special sidebars on choosing meats, basic cooking techniques, and other topics mean that socially-conscious cooks will gain a real understanding of grassfed meat and why it is starting to occupy a central place on the American dinner plate.